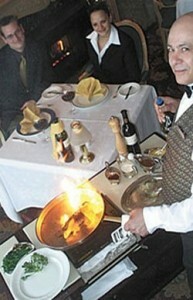 Gueridon Service is a movable service. It is often known as trolley service. It is a special kind of service when a waiter or server prepares food in a table in front of guest sitting beside. Generally foods are precooked in kitchen and then waiter does the final work. Gueridon Service needs high skill, great knowledge, pure concentration and years of experience. Here in this free waiter training tutorial, we will learn some basic procedure on Gueridon Service. Certain qualities and attributes are expected of a waiter in carrying out this forms of service. It is as well to bear the following in mind at this stage. Always remember that first and foremost, you are a sales person. You must sell the dishes, which will involve you in working at the table, suggesting to the customs, item on the menu, this focusing attention in dishes. You may wish to sell. Use the carving trolley and sweet trolley as visual selling lid. Your must always have a good knowledge of the menu so as to give good discipline to the guest of the dishes available. Recognition of the host is an important factor. Stand to left of the host, Each guest should have one yourself for reference purposes. Do not positioning yourself too close to guest as this may cause embarrassment. Size up your host and guest according to ages and nature of the party. This should give you some indication as to the type of dishes on may suggest. Take all order through the host. Try to ascertain the length of time available for the meal as this could determine the type of dishes sold. Warm customer of waiting times. Take note as to whether the party is all male, female or female. Always take the order as soon as possible. Guéridon service is job of chef who also responsible for doing the service. Always push the guéridon trolley but don’t pull to avoid accident. The guéridon should be kept in one position for the service for the complete course. The trolley should never be kept near the service door as it is may be obstruction to the waiter. When more covers are being served, only the main dirt should be served from the guéridon,potatoes, sauces, vegetables should be served in normal manner. Service spoon and fork are not used as in the silver service but held with spoon in one hand and fork in the other. The filling or carving should not be done on silver dish but on the carving board or hot joint plate. Dirty plates should always be cleared from the guéridon trolley. 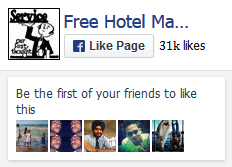 I love this site too much cause it helps hospitality peoples easily to understand. this website make me able to understand easily. i love this program because i am studying hospitality management in my school.